I can't even begin to tell you how excited I am to finally be sharing this space with you all! The nursery has been such a special little room to design and it came together exactly how I pictured it in my head. 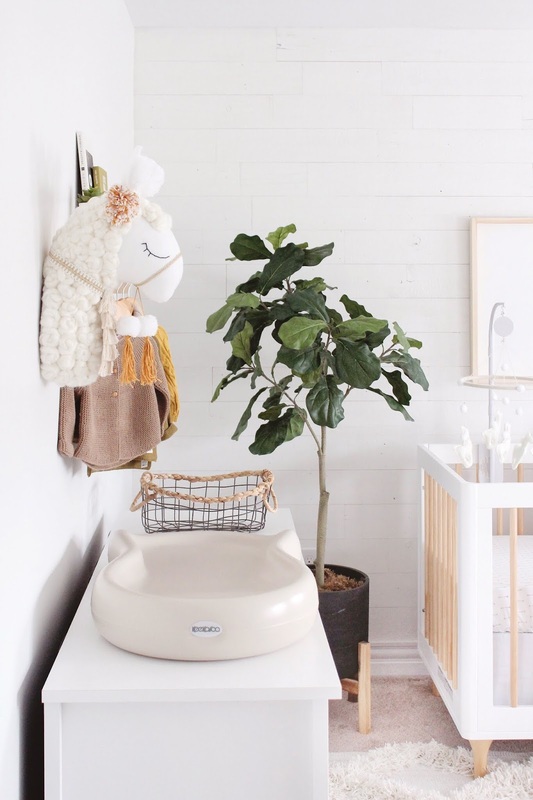 I really wanted it to feel serene and neutral but also cozy with lots of texture, I have said this before but kids spaces are definitely some of my favourites to design. 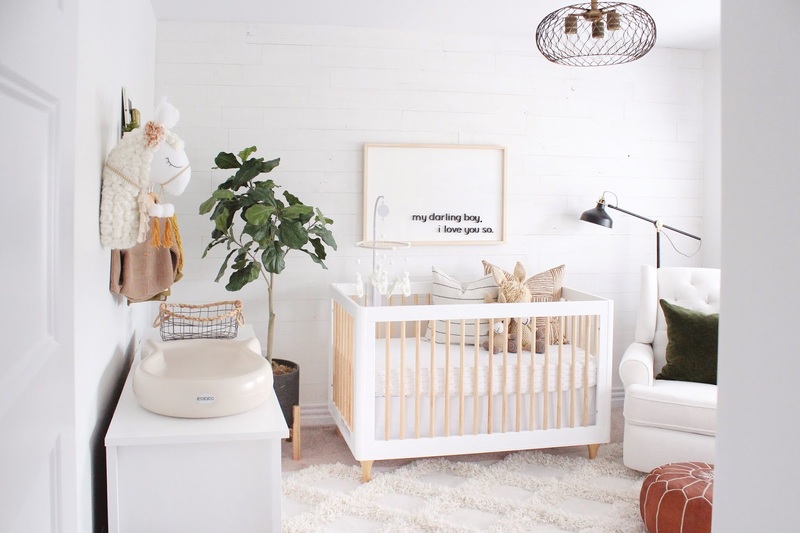 And as if planing for a new baby wasn't exciting enough the lovely ladies at BuyBuy Baby reached out to me to see if I wanted to partner up on sweet babes nursery so of course I said yes and they have been amazing to work with! 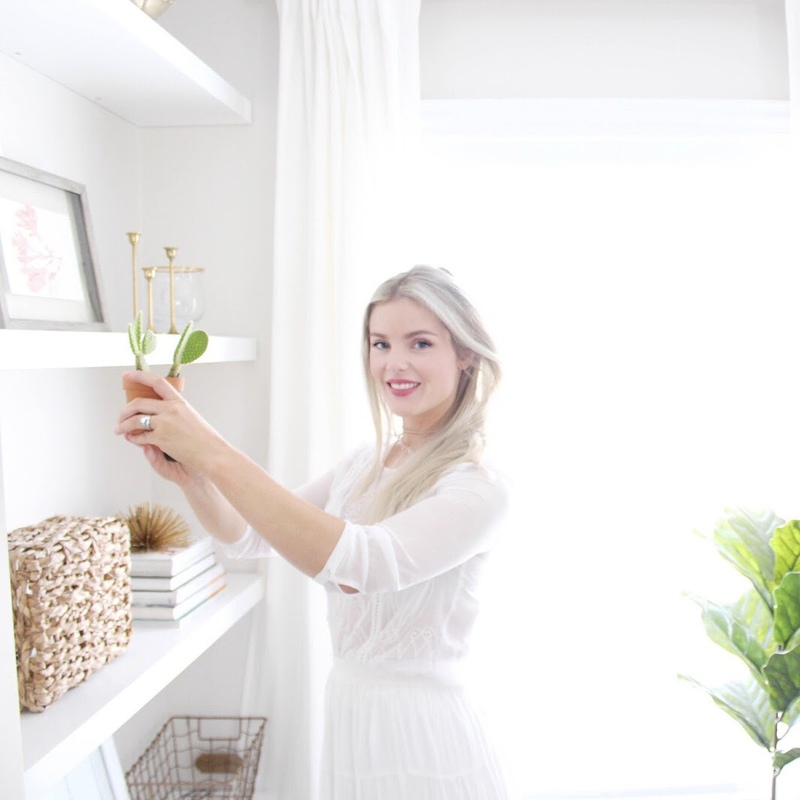 I am all about simplifying things so I love the fact that BuyBuy Baby is a one stop shop and you can find everything you need there for babe and more which when you are doing errands with kids is such a luxury! One of the things I am most excited about is this glider chair! Guys, as a third time soon to be momma if there is one thing you want to invest in it's a great glider chair. You spend so much time feeding, rocking, soothing, snuggling, reading with baby that a comfortable chair is so important. The chair I chose is called the "Finley" and so many of you guys messaged me about it when I shared it on my Instagram stories! It swivels, glides and get this- reclines!! Ah, say what?! Yes night time feeds will now take place in luxury and I am so happy with this chair. Another amazing thing I want to point out is that you can select custom fabric for all the glider chairs at BuyBuy Baby so if you aren't loving the floor model you can completely customize your fabric to get it to match your taste perfectly. This makes getting that custom look so much more accessible to everyone and it really makes a big difference. They have multiple books of fabric swatches which cover every colour and texture you can think of. The fabric I chose is called "Linen" and it's this beautiful soft cream with a fleck in it, and did I mention all their fabrics are treated for the nursery for easy cleaning? Yes- Major score. When I was thinking about the type of crib I wanted for baby boy I really wanted to step outside of my comfort zone and do something two toned. When I saw this Babyletto "Lolly" crib I knew it was the one instantly! 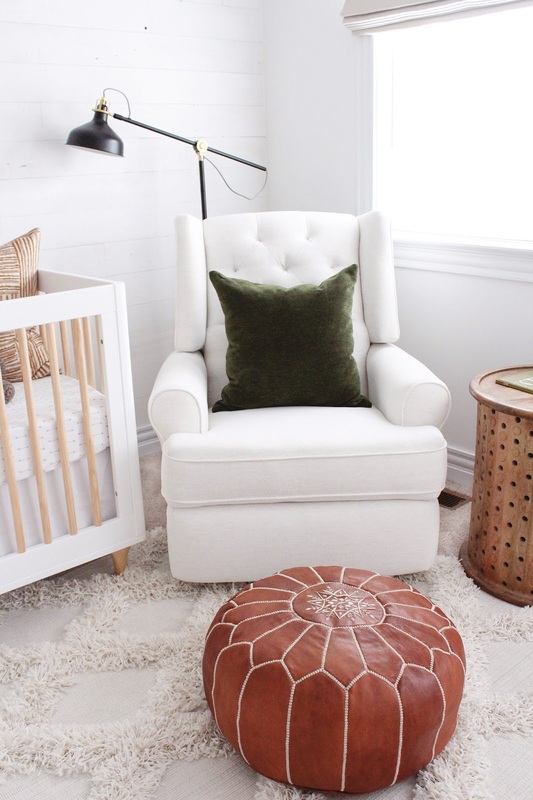 I love how the white is crisp and bright and paired with the natural wood spindles and legs it just gives the exact look I was wanting for the nursery. Plus it came with the side rail to convert the crib into a toddler bed down the road which was a major bonus in my books. None of our previous cribs ever came with this so I think it's a great extra that you get to ensure more time out of the crib bed itself. The nursery room is a pretty good size but I knew I wanted to have a dresser that could function as both a dresser and a changer for baby. 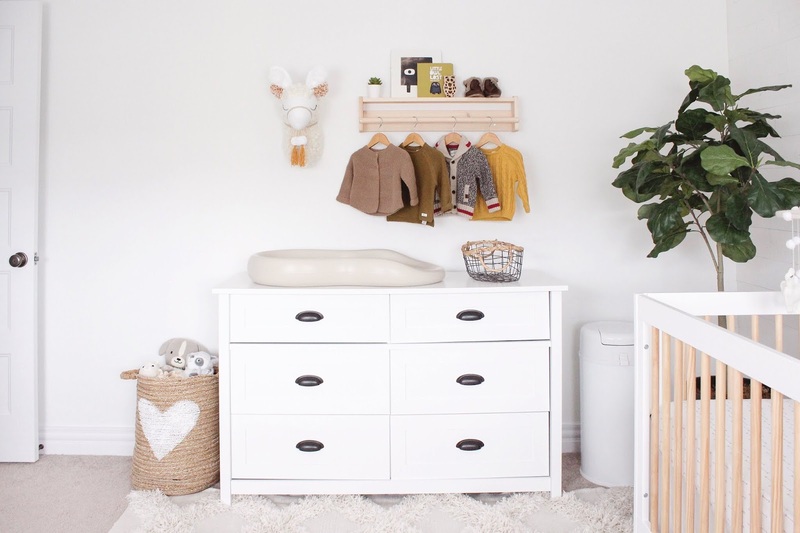 This is one of the best ways to get the most out of your money because when baby out grows the change station you have a functional dresser and you aren't worrying about any additional pieces in the space like a single changer unit if you don't have the space. The Keekaroo Peanut Changer Pad is the perfect piece to place on top of any dresser and instantly turn it into a change station. I love that this one easily wipes clean which is totally a necessity when it comes to diaper changes. It's also nice and cushiony so perfect for little babe to lay on. The dresser is the Childcraft "Abbott" dresser and I love the shaker style door fronts, clean lines and black hardware. I wanted something that could grow with him and I felt this piece was perfect. I am also big on storage so I loved that this has multiple drawer sizes so I am able to keep diapers and wipes in the top drawer neatly tucked out of sight. Would it even be a room without the use of Tonic Livings beautiful throw pillows? 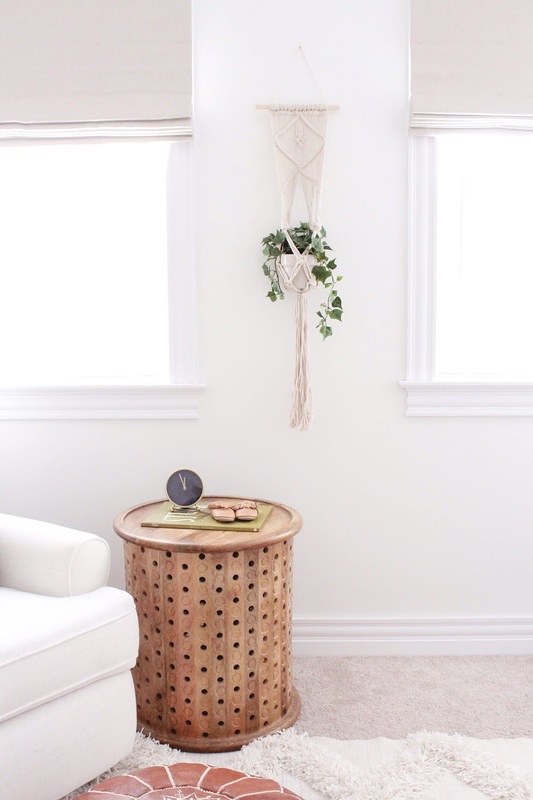 I knew I wanted to incorporate some into the space and this trio has me swooning. The mix of the hunter green velvet on the glider chair, the soft stripe and the cognac print couldn't pair any more perfectly and it really cozies things up! Now of course I won't be leaving the pillows in the crib when little babe is in there but how pretty do they look! When it came to bringing in all the details of the space I was so happy to work with some small local shops that do amazing work. I am sure you spied this beautiful custom sign over the crib- well let me tell you, Wellwood Designs a local shop made this custom piece for me and I couldn't be more thrilled with how it turned out! I knew I wanted this special saying on it and a lot of white space to really make the phrase have impact yet feel minimal. When I shared my ideas with Wellwood Designs they were so supportive and amazing at bringing my vision to life. If you are looking for something extra special for your babes room I highly suggest checking them out! The blinds are from Blindsgalore and are custom black out shades. I don't have enough good things to say about these blinds, they are beautifully made and really tie everything together. I love how clean and fresh they feel and the neutral fabric I selected matches so well with the other fabrics in the room. Also, blackouts are crucial with kids I have come to learn over years especially with time changes and sleep training so I am thrilled to have these blinds in the nursery and the boys room! You may have noticed I went with a subtle llama theme in the nursery and this custom llama head by Animal Head Emporium over the dresser is just so sweet. You can choose any animal or colour combo and I love how these autumnal colours look with the rest of the nursery decor. The detail is amazing and each little curl individually placed makes it look so beautiful. Another local shop I was excited to work with is Im In The Loop. She makes beautiful stuffed animals and also hats. These little llamas in the crib just kill me and the boys have been obsessed with them ever since I brought them home. They are so soft and are just the perfect little touch in the crib. I also got the adorable mustard hat with the fur pom pom from her that is hanging up in the nursery and I can't wait to put it on sweet babe when we come home from the hospital. The beautiful brass light is from Kichler and I love how it brings a bit of an industrial vibe to the space with the wire design and exposed Edison bulbs. You guys always go crazy when I share this rug on my Instagram stories and I am equally in love! It's from Rugs USA and is such a fun, textured piece. Where I went with such a neutral colour palette I love how this brings in lots of interest. The feature wall behind the crib is the same Stikwood Hamptons from when this was my sons room and it still looks so perfect in there. The walls are painted "Delicate White" from Kent Building Supplies and I love how it's a warm white that doesn't feel to stark. It still amazes me what paint can do for a space and the Sico brand was great to apply. I knew I wanted a little peg rack for babes room to hang his sweet little things from so I was excited that Denika from DCWoodworks, a local business was able to whip one up for me no problem! It's the perfect size and I love how all his little blankets and toys look on display. 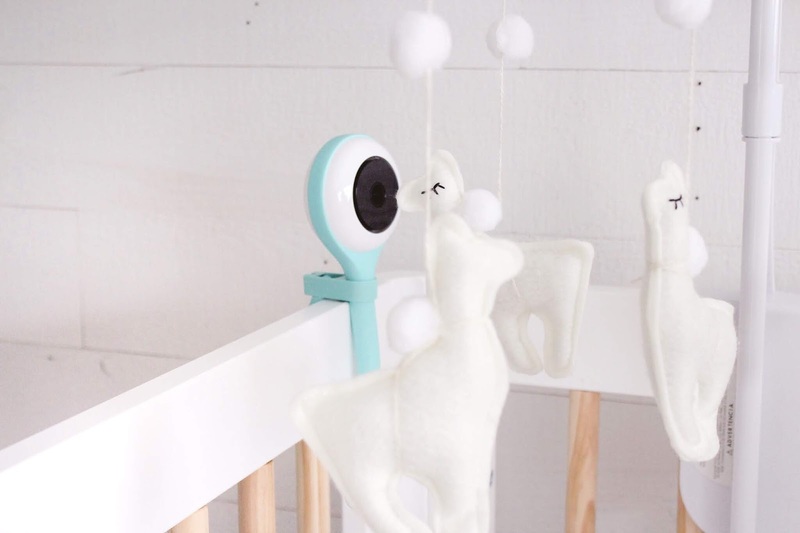 I am really excited about the Lollipop Camera which is just about the coolest baby monitor I have seen! It can be wrapped around different things to get the perfect location to see baby and you download an app and your phone becomes the viewing part of the monitor! How cool is that right?! And the picture is so clear, I love that we don't have to worry about fiddling around with another piece of tech, we always have our phones with us so we can easily check in. Ok well there you have it! I am so happy with this room and now we are just waiting on little man to make his appearance next month. It feels so good to be prepared and ready and I just can't wait for sweet baby snuggles. This post is in partnership with BuyBuy Baby and contains gifted product. Thank you for supporting this blog and the brands I choose to work with. Not sure if I missed it in your description but where is that wood shelf over your changing table from? exact replica watches, combining elegant style and cutting-edge technology, a variety of styles of replica iwc spitfire watches, the pointer walks between your exclusive taste style.